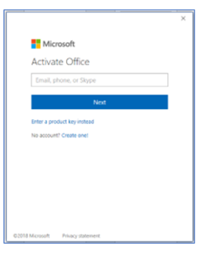 These instructions are written for Windows users, to assist in getting Office 365 installed and activated. Please follow all the steps, as written below. Logon as normal. Close any applications that may open automatically. Locate and open the blue “b” icon in the lower right corner of your taskbar. If the “b” icon is hidden you might have to first click the up arrow to show the hidden icons, as shown below. The IBM BigFix Self-Service Application will open. Windows”. Click on that icon, as shown below and it may indeed be truncated. NOTE: If you don't see this icon yet, please wait a minute. Close IBM BigFix Self-Service window and repeat steps 2-5 again. Click Get at the bottom. The download & install process will begin shortly. 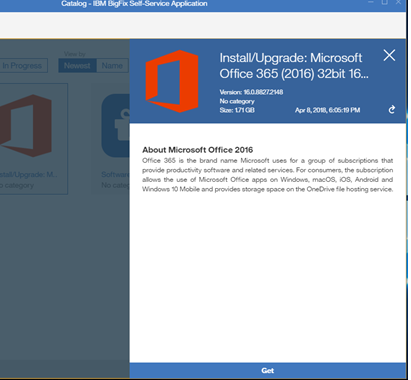 Please let the machine run and do not launch any other applications while O365 installs. This installation may take 20-40 minutes. When it’s complete, BigFix should pop-up a notice asking you to reboot. 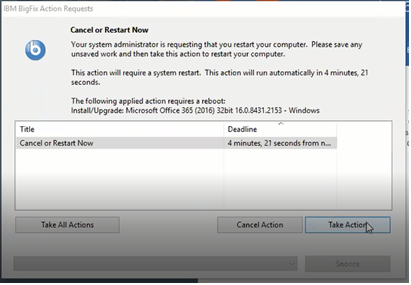 Please click Take Action then Restart Now. After you reboot, log on as normal. From the Start menu, locate and launch **Publisher**. The other programs can cause script errors on login. Please wait a few seconds/minutes for this window to appear. You should receive a prompt to Sign in. 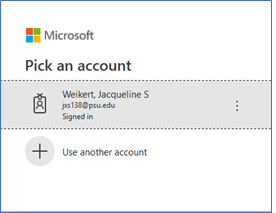 You may see an additional window, similar to the one shown below referring a Home or School MS Office account. PLEASE, click the option associated with @psu.edu. Click Sign In, then type in your Penn State email address (in the format of your userid@psu.edu) then click Next. 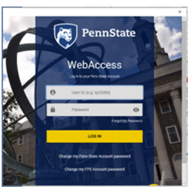 You should see the Penn State WebAccess screen to log in. The WebAccess screen may not fill the window correct in some instances. o If your default 2FA choice is okay, press tab once, then Enter. o If your 2FA choice needs changed to another device, you will need to click tab until you can see the needed parts of the window. Your new Office365 applications should be installed and work as normal. Clean-up: If you had any shortcuts to Office applications pinned to the Start menu, desktop or Taskbar, they will be broken. They will look like a blank piece of paper. To remove the old: Right-click on the old shortcut and select Unpin (from taskbar or other location) or Delete. To add new shortcut: Right-click on the application and choose pin to the taskbar or start menu. Another window will pop-up with the details.